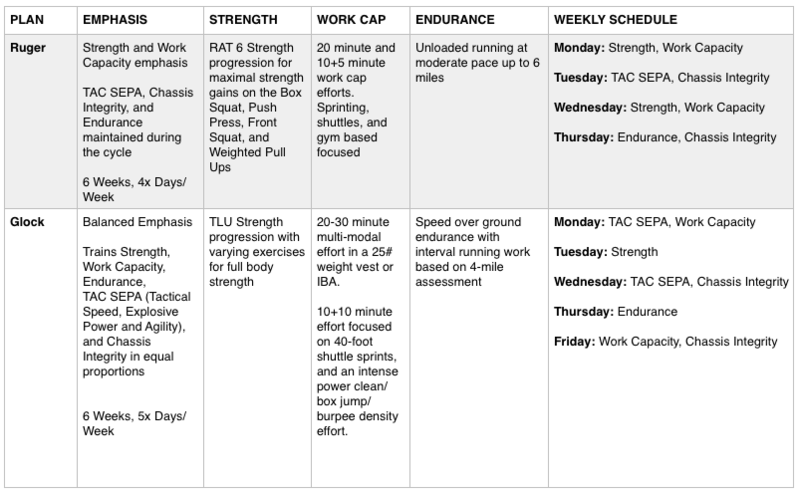 28 weeks of mission direct fitness programming for SWAT/SRT team members – most cycles are 5 days/week, and each includes an unload week between cycles. The price for this packet represents about 30% savings over purchasing the plans individually and saves you $67! 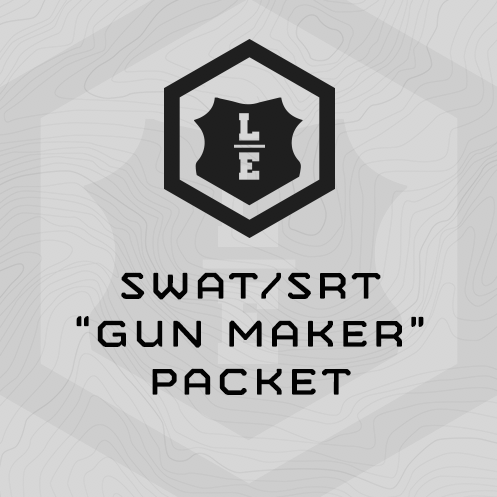 The MTI “Gun Maker” Training Packet is composed of our 4 “Gun Maker” training plans developed for full-time Law Enforcement SWAT/SRT athletes. A 6 week, 4 days/week training cycle, Ruger has a slight emphasis on Strength and Work Capacity. Chassis Integrity, TAC SEPA, Endurance, and Stamina are also trained, but the emphasis on Ruger is strength and work capacity. Ruger is the only 4 days/week plan in the series. Strength – Ruger’s strength work is focused on 4 classic barbell exercises: Push Press, Box Squat, Front Squat and Weighted Pull Up. The plan deploys our proven “Rat 6” strength training methodology which is a percentage based progression based on 1RM (1 rep max). Work Capacity – Ruger’s work capacity effort is focused on a weekly, intense, 15-minute total density effort combining two gym-based exercises. You’ll also complete one other work capacity event weekly – a longer 20-minute effort or a shorter 10 minute hit. 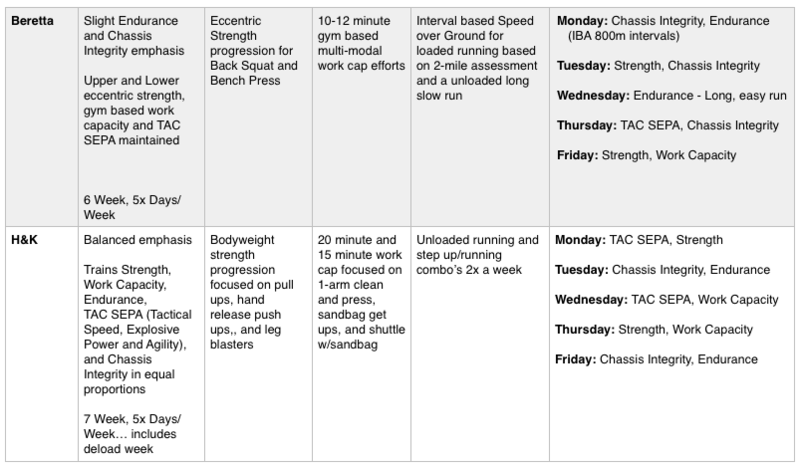 TAC SEPA – One time weekly, agility or speed work. Chassis Integrity – One time weekly, rotation, total and anti-rotation exercises. A “balanced cycle,” Glock trains the 5 fitness attributes in generally equal proportions. Work Capacity – You’ll train work capacity two times per week during Glock, Mondays, and Fridays. Mondays your work capacity effort is a long, 20-30 minute multi-modal effort in a 25# weight vest or IBA. Friday’s effort is split into 2 two 10 minutes events – 40-foot shuttle sprints, and an intense power clean/box jump/burpee density effort. TAC SEPA – Split between two types of events – multi-level agility and sprints/shuttles. You’ll complete drills unloaded fi t, and then loaded in your IBA or 25# weight vest. Strength – eccentric training for strength work in this cycle and focus on two lifts: Back Squat and Bench Press. Eccentric training = slow on the way down. For this cycle we use 5 second drops. Here’s a Eccentric Back Squat example: http://mtntactical.com/exercises/eccentric-squat/ Eccentric work generally requires a spotter. No spotter, do the lifts as normal, using the prescribed percentages. Work capacity efforts in this cycle all deploy the same event – power cleans to shuttle sprints – but the overall event duration increases. This is perhaps my favorite work capacity event for tactical athletes. Chassis Integrity – Beretta deploys three types of Chassis Integrity circuits, all are long grinds (15-20 minutes). ART Circuits (3 core exercises – anti-rotation, rotation and total); Low Back (4 low back exercises) and; Combo (mix of low back and other core exercises). TAC SEPA – Both speed and multi-level agility drills. Work Capacity – One time/week, and built around a combination of light power cleans and 75m shuttle sprints (down 25m, back, down). This specific event is one of our favorite work capacity events for tactical athletes. Fully-equipped functional fitness gym including racks, barbells, bumper plates, plyo boxes, dumbbells or kettlebells, sandbags (40/60/80#). Sprinting area for sprints/shuttles up to 25m. These can be outside. Yes. Click the individual plans above, then go to the “Sample Training” tab to see the entire first week of programming.